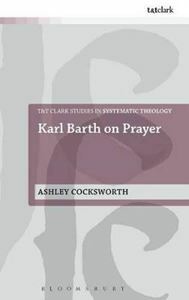 Ashley Cocksworth presents Karl Barth as a theologian who not only produces a strong and vibrant theology of prayer, but also grounds theology itself in the practice of prayer. Prayer and theology are revealed to be integrally related in Barth's understanding of the dogmatic task. Cocksworth provides careful analysis of a range of key texts in Barth's thought in which the theme of prayer emerges with particular interest. He analyzes: Barth's writings on the Sabbath and uncovers an unexpected theology of contemplative prayer; the doctrine of creation of the Church Dogmatics and explores its prioritization of petitionary prayer; and the ethics of the doctrine of reconciliation in which a 'turn to invocation' is charted and the final 'resting place' of Barth's theology of prayer is found. Through the theme of prayer fundamental questions are asked about the relation of human agency to divine agency as conceived by Barth, and new insights are offered into his understandings of the nature and task of theology, pneumatology, sin, baptism, religion, and sanctification. The result is a rich engagement with Barth's theology of prayer, an advancements of scholarship on Karl Barth, and a constructive contribution to the theology of prayer.